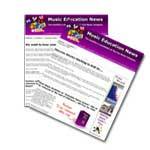 What level of Common General Knowledge in Music is present in your students? For some… there is a LOT! Children now come to school with far more experience than they did Thirty or Forty years ago. It is the information age of the Internet, of Cell Phones and Pay TV.. where information is more readily available than ever before. However some children come to school really lacking in basic general knowledge about music and musical instruments – and its up to us as teachers to make sure that their general knowledge in the musical field is reasonably complete. So can most of your students tell the difference between a Ukelele and a Guitar? And do they know what a Bassoon looks like? I think even with all this technology students often miss simple stuff that we have to make sure they know; things like the members of the woodwind and brass families. Even if they don’t play or want to play those instruments, they’ll need that knowledge one day when they are in the studio and want to add some instrumental parts to their songs. This is really tricky to teach, especially if you don’t actually have the instruments in your classroom. Of course we’d all LOVE to have a full set of orchestral instruments, band instruments and Rock instruments in our music storeroom so that we could pull any out at the drop of a hat to demonstrate what they are and what they sound like…. However…… I don’t think any school on earth has these kind of resources! 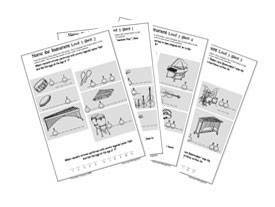 What you need is some worksheets that promote discussion on the different types of instruments, so that you can help build students bank of general knowledge.. just through exposure on a consistent basis. 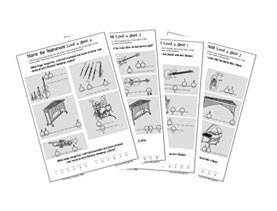 Musical Instrument Games is a set of sixteen worksheets that includes some common, and some not so common instruments… all mixed up so that they present a good mixture of challenge and general knowledge that students will already know. 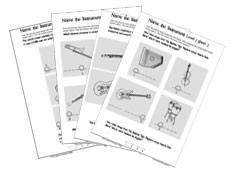 As in the rest of “instant print music lessons” each worksheet solves an interesting trivia question, based around both pop music and classical music genres. 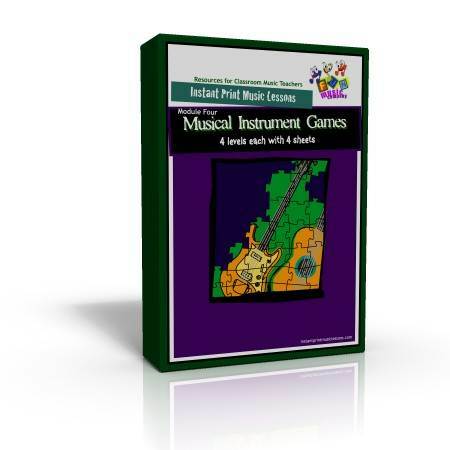 The material covered in Musical Instrument Games is part of the essential general knowledge of any musician – knowing the names of unusual as well as common instruments in every family, and in every genre. 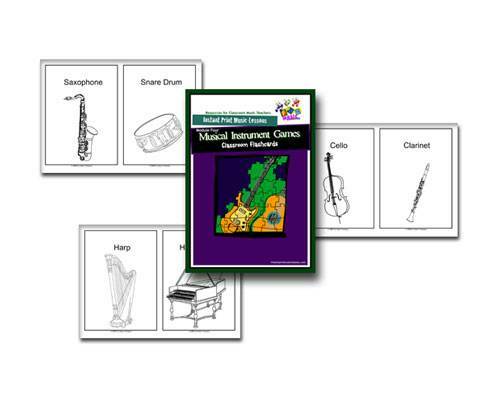 We hope that you’ll find that Musical Instrument Games helps promote discussion on different instruments and their uses, as well as being a fun activity to fill time or extend more capable students. 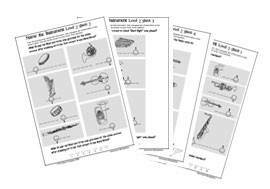 This set of 38 printable flash cards (19 pages) contains every instrument seen in the worksheets, in clear black and white line drawings. 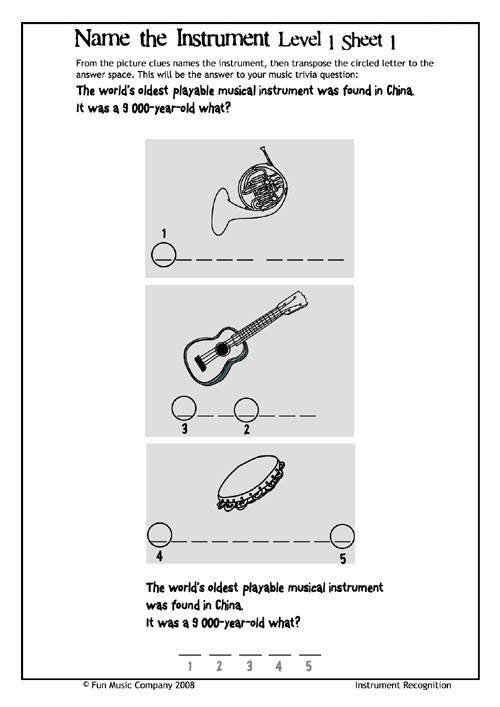 these worksheets are self checking, because if the student does not get every answer correct then they won’t get the right answer to the trivia quesion, however just to be safe we’ve included an answer page for the whole module. This is the way this works – You can purchase module four today on its own for just $19.95 (USD). Alternatively The Whole Module (including the bonuses) is available in the Music Theory Fun Sheets Package deal for a limited time for just $69.95. Answered versions so you’ll be able to give them to relief teachers Priceless!